TheatreWorks is known for its stunning premieres of shows that go on to greatness, and their current production may well follow that tradition. Written by Matthew Lopez, Somewhere, opened its Northern California premiere this weekend to an enthusiastic full house, and this looks to be a thrill ride indeed. Lopez says “the characters are not based on my family; they’re based on my love for my family.” And love is plentiful in this one: love of family, love of tradition, and love making dreams come true. Director Giovanna Sardelli says it best in describing what the play is about when she says “Somewhere is the Puerto Rican answer to the question ‘What happens to a dream deferred?’” Somewhere is a musical but not in the traditional Broadway form. In this show, dance is featured, but the only vocals heard are those in the period recordings in sound designer Jeremy J. Lee’s soundtrack. The story starts in 1959. An opening musical montage serves as an overture as numbers from Broadway and film productions from that era set the scene, each with poignant ties to the action to come. Following the music, the audio from newsreel reports is heard as the lights come up on the Candelarias’ living room. They live on the West Side of Manhattan in a tenement building that is facing demolition to make way for Robert Moses’ latest project, the construction of Lincoln Center. Inez (Tony winner Priscilla Lopez – Matthew Lopez’ aunt) is the matriarch of the Candelaria family, and she’s full of dreams. She dreams that her children will make it big on Broadway or in the movies, all of them talented performers. Lopez is a bundle of energy and is truly a force of nature. Her Inez doesn’t let their reality get her down. She is natural and very funny yet realistic in her interactions with her stage children. Inez’ older son Alejandro (Michael Rosen), or Jandro as his contemporaries call him, was in the Broadway production of The King and I when he was 13. Since then, he’s auditioned for several shows but hasn’t been cast even though he has the potential to be a great dancer. Inez worries that he’s lost his drive, his dreams, and his heart. Together, Rosen and Lopez run from winsome highs to deep pathos as they share some dark family secrets later in the story. Francisco (Eddie Gutierrez), Inez’ younger son, isn’t the dancer his brother is, but he dreams of becoming an actor as he takes classes to hone his craft. Rebecca (Michelle Cabinian) is the baby of the family. Only a teenager, Becky too is a dancer with big dreams of making it in musicals. Finally, Jamie MacRea (Leo Ash Evens) is Jandro’s boyhood best friend and is also a dancer. He has made it big and has become Jerome Robbins’ assistant choreographer on Broadway and in film. Scenic Designer Andrea Bechert has created a stunning and detailed view into the Candelarias’ home. Each act gets its own set showing the Candelarias’ living room before and after they are forced to leave the West Side to move to the Brooklyn projects. In each case, the kitchen table, sofa, chair, and sewing machine are present, although the arrangement is slightly different. In Act 1, there’s also a fire escape, and clotheslines are strung across to neighboring buildings. 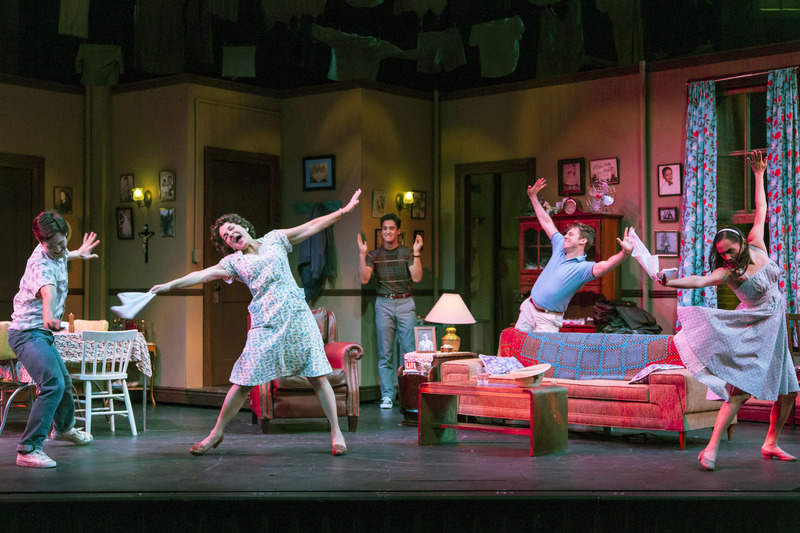 Given the furnishings, Greg Graham’s choreography is all the more impressive as the dancers wind their way around and over the furniture without missing a step. Only once is the set dispersed to open the stage for a far more expansive solo dance number late in Act 2. Steven B. Mannshardt’s lighting design is also impressive. The show makes good use of the sharp contrasts between real life and dreams with quick changes, the cues all spot on, changing from the established ambient lighting to a slightly fuzzy, more ethereal and colorful light balance when fantasies ensue. We get several tastes of the impromptu dancing that is a daily part of Candelaria life at home. One number in Act 1 erupts after Inez and Becky return home from arranging auditions for the film version of West Side Story. Filled with hope about the upcoming audition, Evens and Lopez pull Cabinian and Gutierrez into a number that starts in a rather unstructured form but slowly evolves into a replica of the “Shark Charge” as the choreography becomes very tight and stylized. Cabinian’s standout moment occurs in a fantasy scene as she’s setting the table for dinner at the end of Act 1, Scene 2. As the lights shift, she has a beautiful solo number, moving gracefully as her character is clearly dreaming about what it would be like when she’s cast in West Side Story. She handles the tableware delicately while she glides through the room in a fanciful number. As the brooding Jandro, Rosen captures expressions of frustration as his character struggles to support the family in his father’s absence, working double time to try to stay ahead of their expenses. And Rosen is a very smooth and artistic dancer. He has several solo and duet moments during the show where he gets to display his grace and athleticism. One very touching moment comes in Act 2 when, while cleaning up after a dinner disaster, the music overtakes Jandro. Rosen briefly breaks from sweeping to dance with the broom in his hands until he sheepishly stops when he’s caught in the act by Inez. Another stunning dance moment for Rosen occurs in Act 1 when Jamie cons Jandro into dancing by intentionally botching the steps to a routine that Jandro and Jamie used to perform as boys. As the two of them reprise their parts in the soft shoe from days past, Rosen is elegant and suave while Evens is stylistically more deliberate, but the two make an appealing dance duo. Rosen, Gutierrez, and Cabinian are believable as siblings, not as rivals, but as three people who care deeply about one another. Their discussions flow naturally, and sometimes viscerally, as they occasionally all talk at once as each tries to be heard. About the only criticism noted is that the soundtrack is occasionally overpowering. That may be by design to achieve a harsher impact overall, and fortunately, it never buries the actors. Together, Sardelli along with her cast and the rest of the production staff have assembled a stunning spectacle that will take hold of you and won’t let go until long after you’ve left the theatre. Don’t miss TheatreWorks’ production of Somewhere. When: Tuesdays – Sundays through 10 February 2013. See www.theatreworks.org/shows/1213-season/somewhere for more information or to order tickets.